A tasty addition to your appetizer lineup. In a large skillet, melt butter over medium heat. Add onion, and cook until translucent, 4 to 6 minutes. Add bell peppers, and cook until soft, 6 to 8 minutes. Add garlic, and cook until fragrant, about 1 minute. Remove from heat, and reserve. In a large bowl, add lemon juice, parsley, mayonnaise, mustard, salt, chives, red pepper, black pepper, and eggs. Whisk to combine. Add reserved onion mixture, crawfish, bread crumbs, cornmeal, and melted butter. Gently combine with a rubber spatula. Using a 1-ounce spring-loaded scoop, form crawfish mixture into balls, then slightly flatten. In the bowl of a food processor, combine red pepper, sour cream, basil, and olive oil. Pulse until combined and transfer to a small bowl. Set aside. In a large skillet, heat 3 tablespoons oil over medium to medium-high heat. Working in batches, cook cakes 3 to 4 minutes, until golden brown and beginning to crisp. Using a fish spatula, flip cakes, and cook 2 to 3 minutes more. Remove from heat, and let cool on a wire rack. 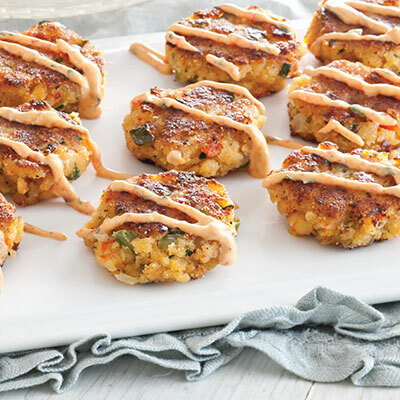 Serve with reserved red pepper remoulade. I’m making the crawfish cakes but confused. You have listed step 3 then it ends with set aside but never mentioned again. I’m assuming this is the remolaude sauce? that goes on top. Thanks for asking, Becky. Your hunch was right, that mixture in Step 3 is the remoulade. We edited the end of the recipe to make that more clear. We’re sorry for the delay! 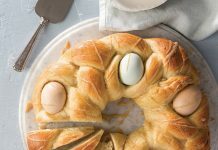 Both eggs are actually added at the same time; we’ve updated the recipe to reflect this change. Thank you for writing! Where does the second teaspoon of salt and second 1/2 tsp of ground black pepper go? In the original recipe, we added a bit extra salt and pepper to the remoulade but decided that it wasn’t necessary. The recipe has been updated. Thanks for commenting! These were delicious! I made them exactly as written except used a 1/3 cup measuring cup to make 12 “dinner size” cakes instead of apps. Husband loved them! A keeper. Can these be made a day ahead and heated in the oven when served the next day? 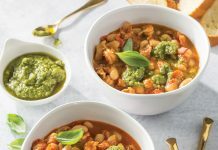 We think you would have acceptable results making these ahead and reheating, but the crunchy parts will never be quite as good as they are when they’re fresh. 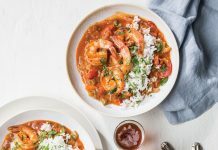 The best option would be to prepare and shape the crawfish cake mixture (and sauce) the day before, cover and refrigerate them, and then cook them just before serving. Is there any way that the nutrition info could be added to your receipts. Thank you.